Ewe clipping is getting under way, for all there are alot of hill sheep in Tarset there are also those which run on the lower ground and they do clip quicker. 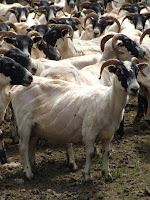 Here we are into July and given another fortnight many of the sheep will all be shorn, weather permitting. Ewes are a treat after the hogg clipping, heavier admittedly but more co operative and if you're lucky they'll have bare bellies - y'just canna whack a bare belly! Two shearers evenly matched clipping side by side - the one who gets the bare belly will finish first with insinuations of whaling from the other. whaling (I've got absolutely no idea how it's meant to be spelt) is the age old tradition of picking the best clipping sheep out of the pen, always been a bone of contention between shearers, keeps the competition strong to see who can get to the pen first to get the best out. So how do you tell a good clipping sheep? you can be caught out but generally there are one or two pointers, the main one being the crown (between the horns) if there is still wool and hairy bits between the horns then look out, she'll likely be slower going and could even stick the comb up a bit. No sign of muffy stuff between the horns and wool well opened out at the neck could well be a godsend and a bare tail will almost always go with a bare belly. 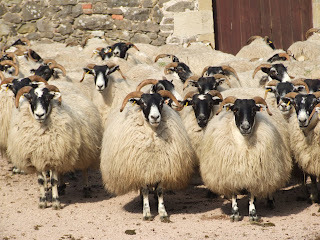 Many sheep now run along a shearing race to be clipped, they filter along in single file and are caught out of side doors - still there are accusations of whaling "how'd this un get past your door then?" "struggle to push her up did you" "how come you're getting all the bare bellies?". At the end of the day it's all good humoured banter, the sheep are to be clipped and that's what'll happen. The ewes are gathered and the lambs run off and left standing in the pens until their mothers have had their short back and sides when they will be reunited. Quite a shock for the lambs, they've been running alongside these big woolly mothers for a couple of months then suddenly there is a complete change in appearance, they still manage to get themselves mothered up all the same. The lambs grow overnight, it's striking how much bigger the lambs appear to be once their mothers have lost a years growth of wool and shrunk in size! There are mixed reports regarding the clipping, personally I think hill ewes are better going than the 'in-bye' ewes, they would possibly get a bigger slip in condition prior to lambing, then coming onto the lambing pastures and a bite of cake would give them a lift. After lambing time when they returned to the hills their ground had freshened up nicely, the hills had greened up and the ewes were on a rising plane, all helping to give them decent rise at clipping time. There'll be someone out there totally disagree with me but then not all conditions are the same on every farm so there will always be variations in the flocks.